Where should ESPN’s College GameDay have really gone in Week 4 instead of NYC? We hear Boulder, Colorado is nice this time of year. ESPN is known for taking College GameDay to at least one unsuspecting spot on the college football map every year, including stops at FCS schools like North Dakota State and James Madison or Harvard. It is a nice reminder that there is more to college football than just what’s going on in the Big Ten and SEC, because college football is enjoyed on various levels. Perhaps one day, GameDay will setup in front of a big time Division 2 game. Or maybe it will one day finally make a trip to Pullman, Washington to satisfy the long-starved Washington State fans. This week, GameDay is heading to Times Square in New York City with the hope of capturing a melting pot of college football fans in the Big Apple. The initial reaction to the decision made last week has not exactly been a warm and fuzzy one, with critics suggesting Times Square is as much the opposite of everything that makes college football great as possible. Credit ESPN for thinking outside the box on this one, much to the dismay of the college football fan. Nobody saw Times Square coming. In his preseason prediction of each stop on the GameDay tour for this season, Jim Weber of College Sports Only predicted GameDay would be setting up in Stillwater, Oklahoma for the Oklahoma State-TCU game. He predicted it would be a matchup of top 20 teams, and he nailed it (Oklahoma State is No. 6 and TCU is No. 16 in the AP Top 25) and the game is just one of two games between top 25 teams this weekend (No. 11 Georgia vs. No. 17 Mississippi State being the other). 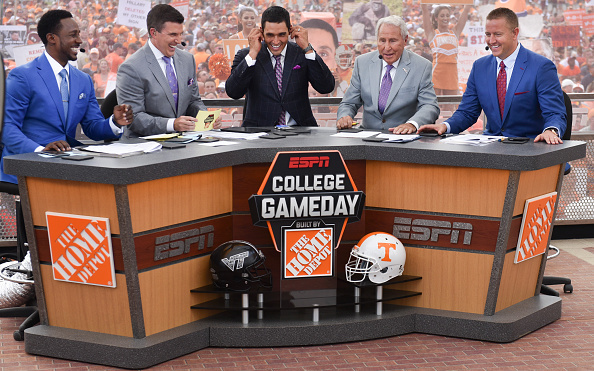 Should GameDay have stuck to the traditional formula and made their way to Stillwater or another destination on a college campus this week? That is what our roundtable discussion focuses on today. Matt Lichtenstadter (@MattsMusings1): Because of Disney, GameDay is in Times Square this week and not many people are pleased. But there aren’t a ton of great choices this week for Gameday, though there are a few. Obviously, Iowa City would be cool, because of #GoIowaAwesome. Going to Vandy for one of the biggest games in recent program history against Alabama would have also been a cool move. Everyone wants GameDay to go to Pullman at some point, but they’re obviously waiting for a game that ESPN controls on TV to do that. They could have gone to Athens for Mississippi State/Georgia too. They had plenty of choices, but if I made the decision, I would have liked them go to Vandy. Alabama doesn’t come to Nashville that often. Yesh Ginsburg (@yesh222): If it was logistically feasible, I would go to Houston. The Cougars are undefeated, are hosting an undefeated Power 5 team, and it should be a fun matchup. Additionally, it would be a great moment for the city and football fans in the midst of rebuilding and recovering from Harvey just a few weeks ago. Or, at the very least, host it somewhere less than 217 miles away from Houston — that’s the distance from Times Square to the nearest football game on Saturday, at Navy–Marine Corps Memorial Stadium in Annapolis, MD. What game is GameDay going to Times Square for? It kinda kills "GameDay" when the nearest game is in (no joke) Annapolis, Maryland. Kevin McGuire (@KevinOnCFB): This one is pretty easy for me. As much as Stillwater, Oklahoma makes sense for the most attractive game on the schedule (which is also being aired by ESPN), I would be sending the GameDay crew out to Boulder, Colorado for the first time since 1996. I’d skip the trip to Stillwater for Oklahoma State-TCU and bank on making the trip later this year for Bedlam between Oklahoma State and Oklahoma. The time to return to Colorado’s campus now makes so much sense to me with a Pac-12 Championship Game rematch between No. 7 Washington and a 3-0 Colorado. The show has already been on the scene for games involving the ACC, Big 12, Big Ten, and SEC. It’s time to get the Pac-12 in the mix, and the scene in Boulder, Colorado would be a good one to highlight for the first time since September 14, 1996 for a game between No. 5 Colorado and No. 11 Michigan. To put that in a little more perspective, Air Force has hosted GameDay three times since the show’s last trip to Colorado’s campus. It’s time. Terry Johnson (@SectionTPJ): As I noted in my weekly thoughts and observations piece last week, I don’t know why people are so upset. Is New York City an ideal venue? Of course not! However, as someone who wants to see college football’s popularity continue to grow, I want to see GameDay go to as many places as possible. That’s why I wish GameDay had visited to Berkeley this weekend for USC-California. The Bears are one of the most pleasant surprises in college football this year, racing out to a 3-0 start. It’ll be interesting to see how they fare against a Trojan team that many expect to win the Pac-12 title (despite its early struggles). For what it’s worth, the last time GameDay featured these two teams (at USC), they produced one of the best games of the year, with No. 1 USC edging No. 7 Cal 23-17 in 2004. Ian Casselberry (@iancass): My vote goes to Athens for some Bulldogs-on-Bulldogs action. Georgia is ranked No. 11 in the nation and No. 17 Mississippi State comes to town following its demolition of LSU. It’s a big SEC matchup and Georgia’s first conference game of the season. Georgia has a notable preseason win over Notre Dame in South Bend. They also have plenty of storylines which can be covered, such as coach Kirby Smart in his second year, their potential quarterback controversy and stars such as Nick Chubb and Sony Michel. I don’t know if Georgia fans ultimately want to see GameDay on campus. The Bulldogs are 1-2 when the Saturday morning spotlights shines on them. But the show hasn’t been to Athens since 2013, and this seems like an ideal time to return.